SeaWorld Entertainment, the aquatic theme park operator that has taken a financial and PR hit over criticism of its treatment of killer whales, said today it plans to build new environments for the orcas at its parks, create an independent advisory panel and fund $10M in ocean health programs. Artist renderings of the new orca facilities. Owned by private equity giant Blackstone, Sea World has suffered fallout from the critical 2013 documentary "Blackfish" and said this week revenue will likely fall seven percent this year. Sea World's Friday announcement -- the Wall Street Journal ran the story first this morning ahead of the official announcement -- included an endorsement from California Assembly Speaker Toni Atkins, a PR volley aimed to counter a legislative push in the state to outlaw orcas in theme parks that was mentioned by Sea World in its second quarter earnings release. "I have high expectations for SeaWorld in light of today's announcement that major investments will improve the experience and outcomes for whales both in their parks and in the wild," Atkins said in the SW announcement. Sea World VP of communications Fred Jacobs has not yet been reached about the PR efforts behind the changes. The firm last year enlisted entertainment-savvy PR shop 42 West to help counter the Blackfish effect. 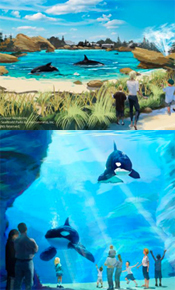 The park operator said today it will double the water capacity of its orca tanks as part of its Blue World Project, which is also aimed to increase visitor viewing of its trademark mammals and provide a more natural environment. The changes are expected to be incorporated at its San Diego park by 2018, with Orlando and San Antonio revamps to follow. The company will also match $10M in funds to counter threats to killer whales in the wild, on top of existing research conducted by SW. An advisory panel of scientists, academics and others was also created. Blackstone took Sea World public last year after the release of "Blackfish." Shares plunged 33 percent on the company's profit warning Aug. 13. SW CEO Jim Atchison told the WSJ: "We're a 50-year-old company and we'll have difficult quarters, they'll come and they'll go. But we have an enduring brand and a unique position in the marketplace." People for the Ethical Treatment of Animals rapped Sea World's changes as a "desperate drop-in-the-bucket move" and urged the company to create seaside sanctuaries for the whales. "A bigger prison is still a prison," said PETA Foundation director of animal law Jared Goodman.